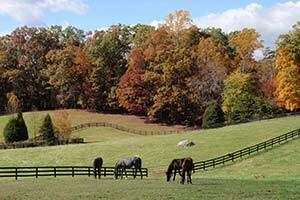 Hyperion Stud is located in Barboursville, Virginia and encompasses a total of 160 acres. 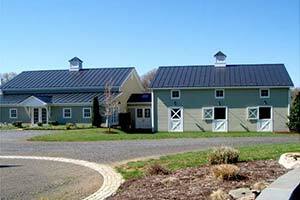 This state of the art equine facility meets the demands we face with our breeding and sales program. 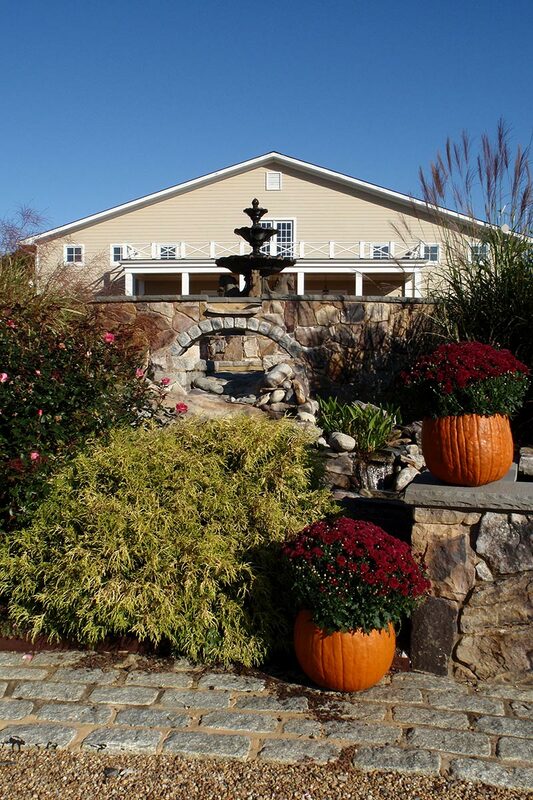 As you enter through the gates of the farm you are instantly drawn to the lake with jetted fountains, and a view of the beautiful Stallion barn. Traveling up the driveway you approach the main barn complex and indoor riding arena. Hyperion Farm continues with an outdoor riding arena as well as our new 6-stall training barn, covered walking machine and longing arena. There is also ample turn out space for all of our horses with shelters and automatic waterers for their comfort, and the entire facility is under 24 hour surveillance. Today, Hyperion Stud has 3 working farms. The main farm in Barboursville, a 115 acre turn out facility in Madison, VA and a 10.3 acre training facility in Wellington, Florida. The main barn is complete with four 12×12 stalls (convert to 2 foaling stalls), four 16×16 heated dedicated foaling stalls, wash area, feed room, tack room and main office. In addition to the barn is the hay and shavings barn, mare palpation and insemination shed, equipment garage and outdoor riding arena. This state of the art Stallion barn includes 4 padded and heated 12×12 stalls, heated wash area, tack room, full service veterinary laboratory, heated and cooled collection suite, 5 stallion paddocks, back up generator and hi-tech security system. Built in 2005, the 220 x 80 indoor arena is the perfect place to train all year round on the dust free Terra 2000 footing. The arena can also accommodate our portable jumping chute for our young stock. Clients can come and view select youngsters and sales horses while relaxing in the beautifully appointed lounge. 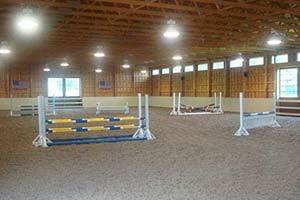 Regulation size dressage arena with plenty of room for flatwork, longing and jumping. The footing is complete with a sand and recycled rubber mixture and can withstand ample amounts of rain without pooling up. 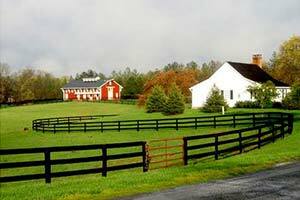 This beautifully situated arena is the perfect place to enjoy the peaceful surroundings of the farm. Our new Sales & Training complex consists of a 6 stall barn, 6 horse walking machine and longing arena. Also included are 5 new turn out paddocks. Situated in Wellington, FL on 10.3 acres. 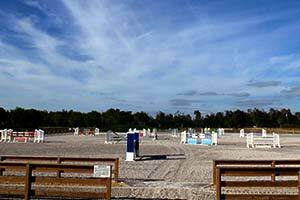 Over 100,000 sp/ft of riding surface with a grass derby field, sand arena and gallop track. There are 24 stalls, a walking machine and ample turn out. 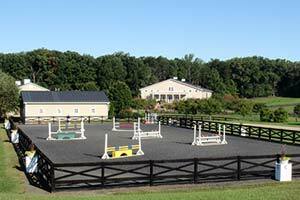 The entire farm was renovated after purchase in 2011 and boasts the perfect setting for training the competition horses. Stalls are available for rent during the winter season. Please contact us for more details. 115 acres of rolling fields with 8 large pastures which include automatic waterers and large run-in sheds. The perfect environment for our breeding stock and youngsters.